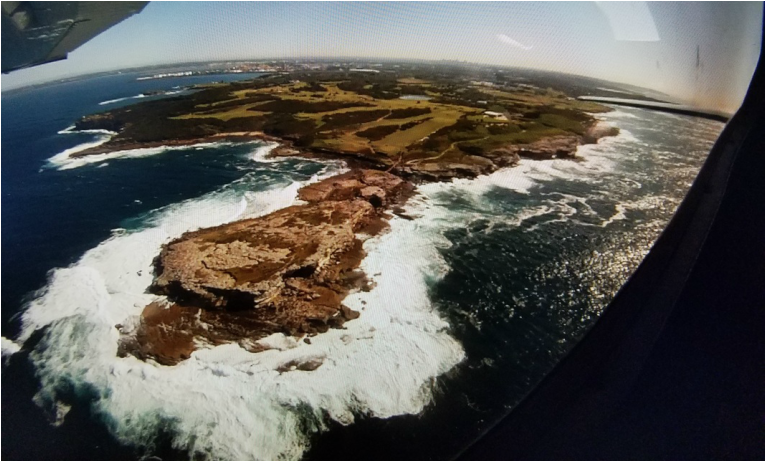 It was our first time to Sydney and we really wanted to see what it looked like from the air. 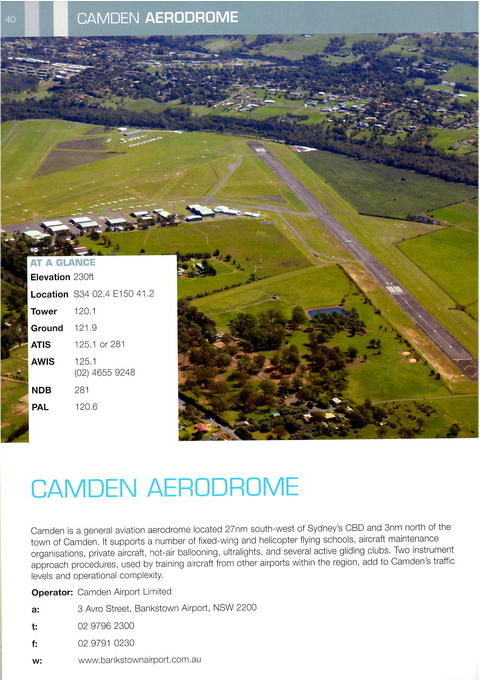 We also wanted to see what Australia's aviation system was like. So, I e-mailed Airborne Aviation and booked a C-182 to go up with a local instructor. Note: When scheduling this same type of flight yourself, be sure they understand you are a pilot and want to fly yourself. 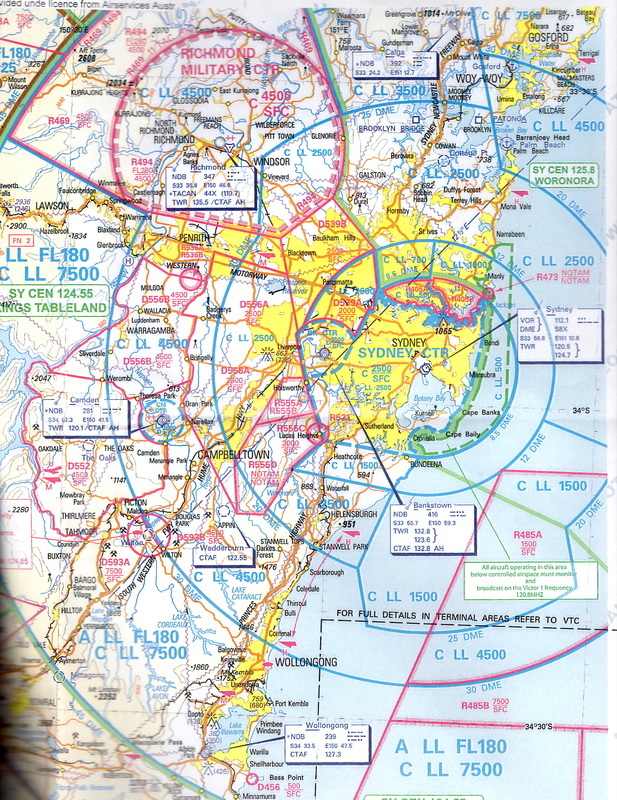 You are hiring a CFI as an instructor to show you the area and keep you out of trouble (mostly airspace, communications, and miscellaneous regulations). He/she is not flying and you are not a passenger who is going on a "joy ride" (ok, all flights are but you know what I mean!). The rates for chartering and flight instructing are normally VERY different. Ok, I got past the cost because it's a one-time event; however, I can tell you I could not learn to fly in Australia. I would be broke by my 1st solo. Wow! ​The Civil Aviation Safety Authority (CASA), essentially their FAA, actually designed a few popular routes (air trails as I like to call them?) 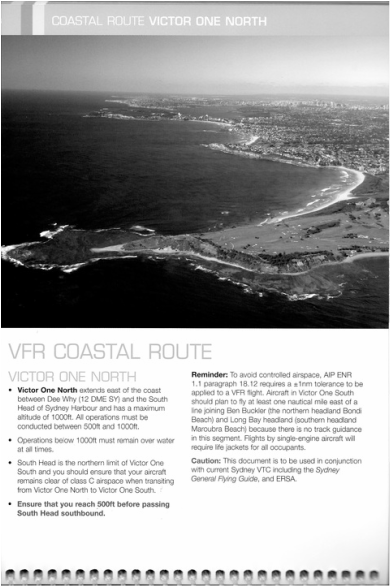 for the Sydney area so everybody would follow the same routes and altitudes while staying outside of controlled airspace. 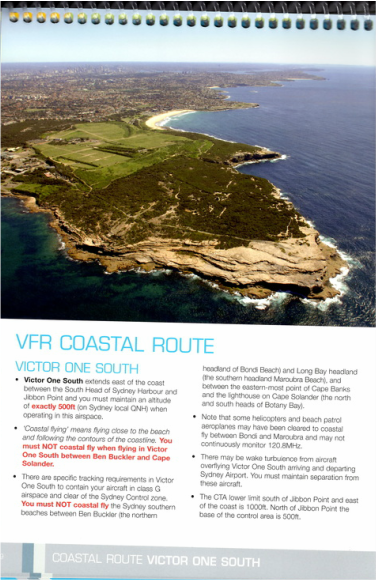 We chose Route Victor One (or V1) which took us all around Sydney and the nearby surroundings. It was beautiful! ​This is what their "sectional" and "terminal" look like. Pretty similar to ours, right? 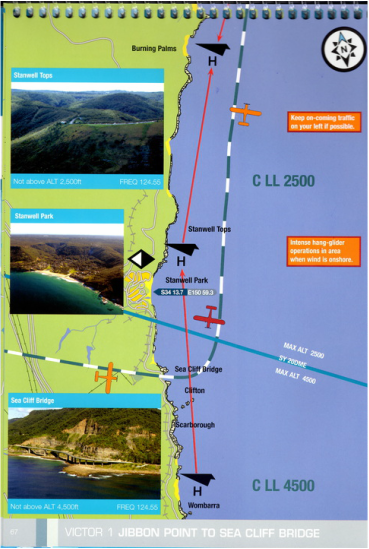 I can actually see parts of the route we flew, marked by purple circles, and I can clearly see the 500 feet AGL restriction we had to comply with over the water, east of downtown. 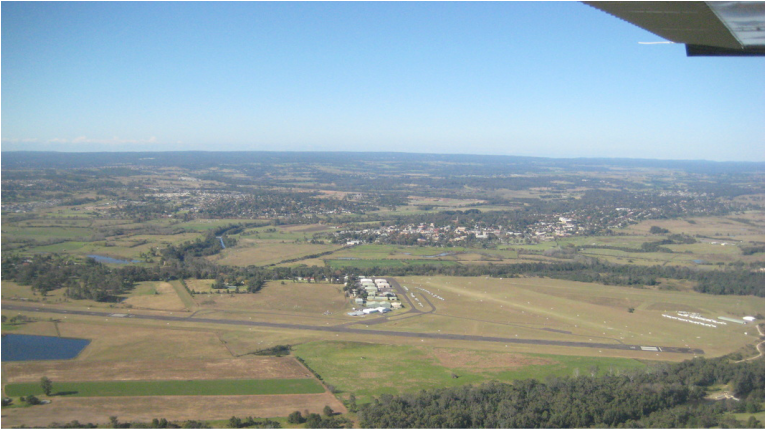 So, we jumped on VH-SRE, a nicely equipped C-182, and off we went. But not before putting a life vest on. That's what flying at 500 feet over the water gets you! 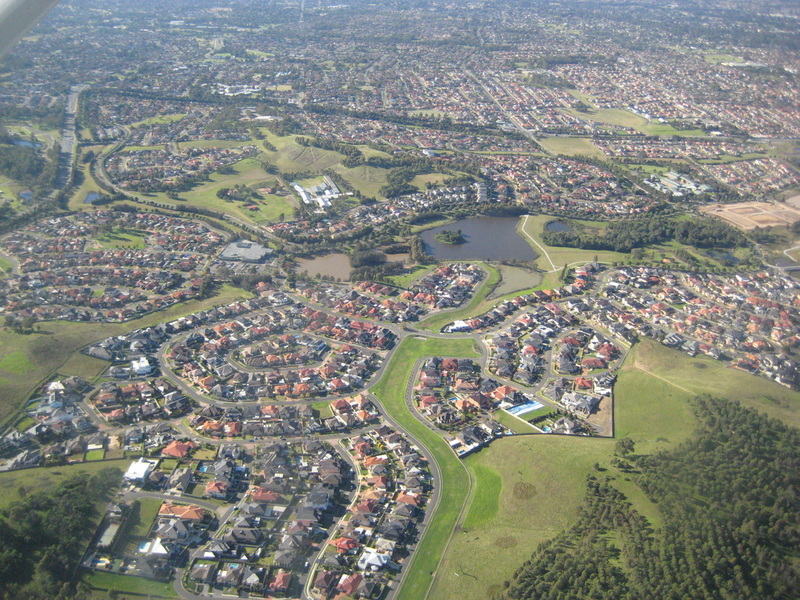 Then we flew over to Horsby via Parramatta. 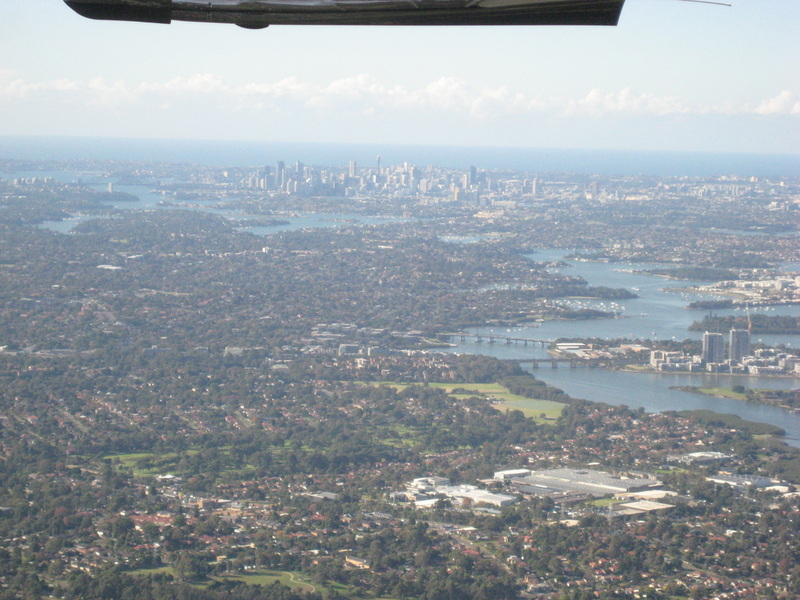 We got our first good view of downtown Sydney just past Parramatta (picture below). 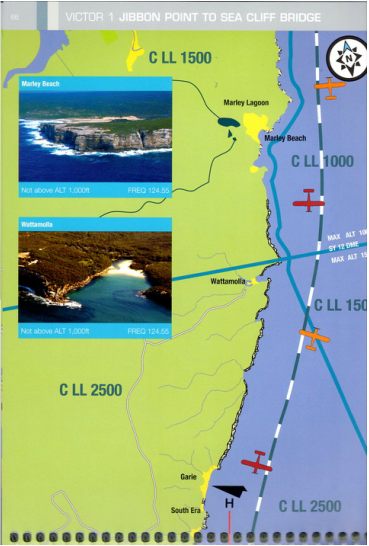 ​Once at Horsby, we turned right towards the coast. 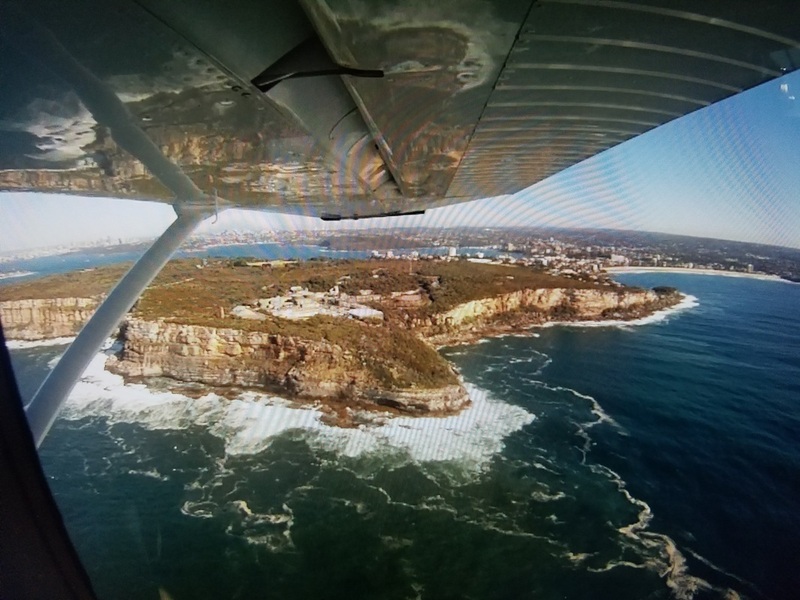 We followed the coastline southbound to Stanwell Tops at 500 feet AGL, flying right by Sydney's beautiful beaches (Manly and Bondi especially) and just left of The Heads and Botany Bay (where the commercial airport SDY or YSSY is). 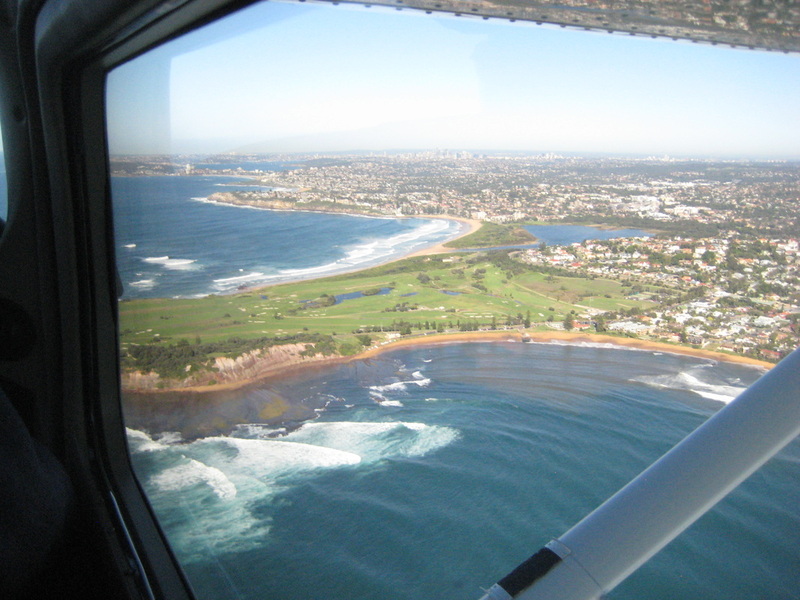 Starting our southerly cruise, north of the Long Reef Golf Club, between Collaroy Beach (on the north side) and Dee Why Beach (on the south side). Freshwater Beach on the right and Manly Beach under the strut. 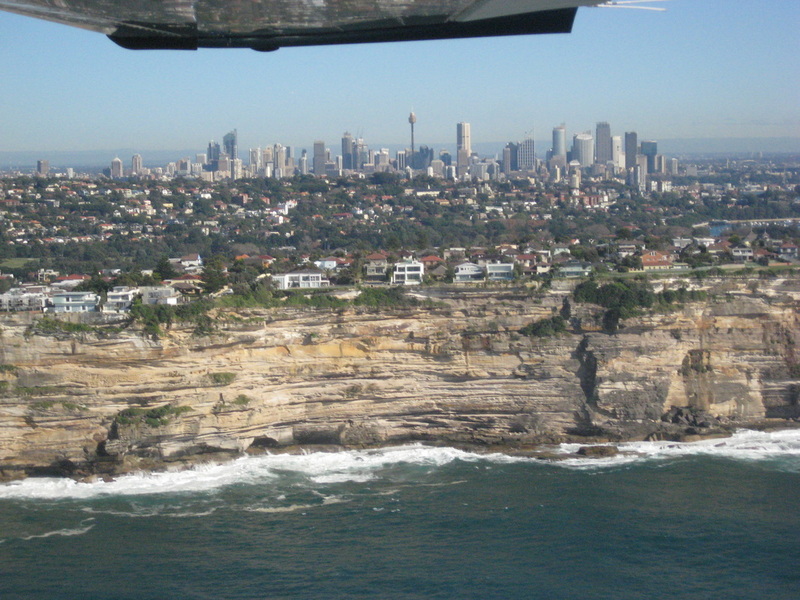 The Sydney Heads form the two-kilometre-wide entrance to Sydney Harbour. 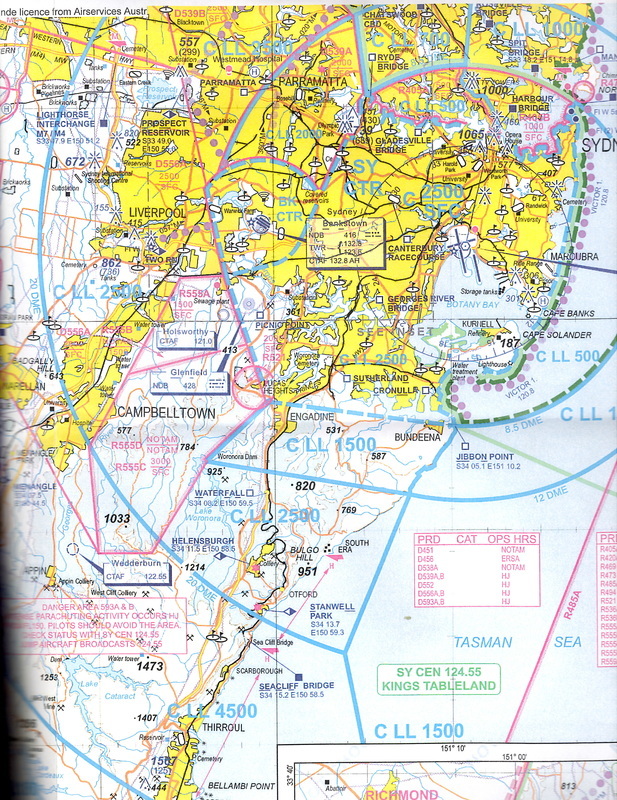 North Head and Quarantine Head are to the north; South Head and Dunbar Head are to the south; and, Middle Head, Georges Head, and Chowder Head are to the west and within the harbour. No need for an explanation! Just pictures of spectacular Sydney, including the Sydney Harbour Bridge (which we climbed and don't necessarily recommend due to its high cost). 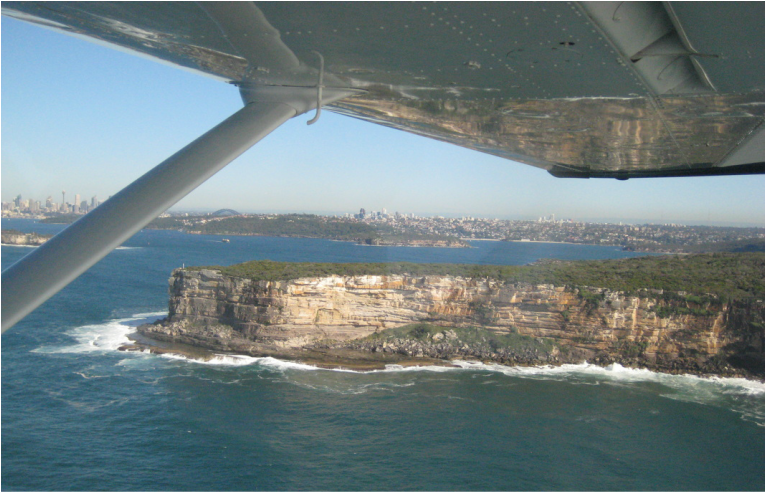 Just past Stanwell Tops, we flew by the impressive Sea Cliff Cridge (pictured below) at which point we turned right again, back to home base - Camden. 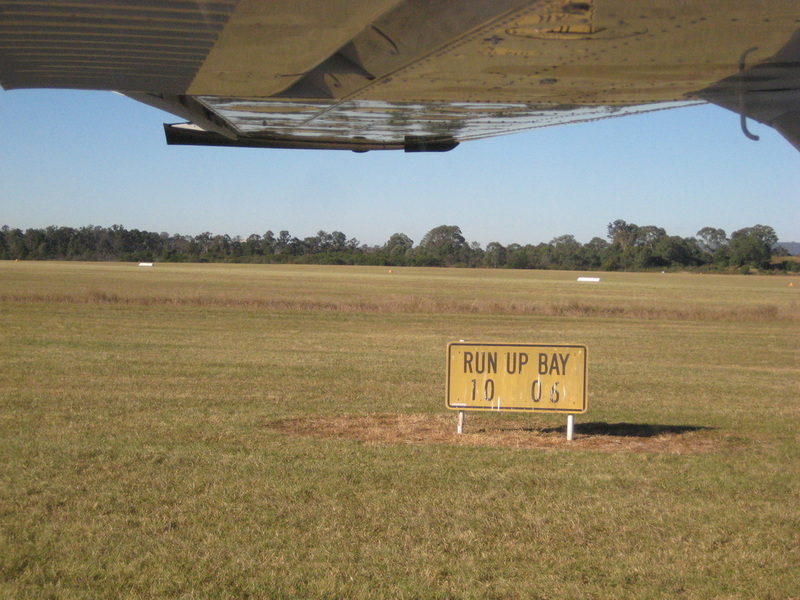 On a left downwind for runway 06 back at the Camden Airport. 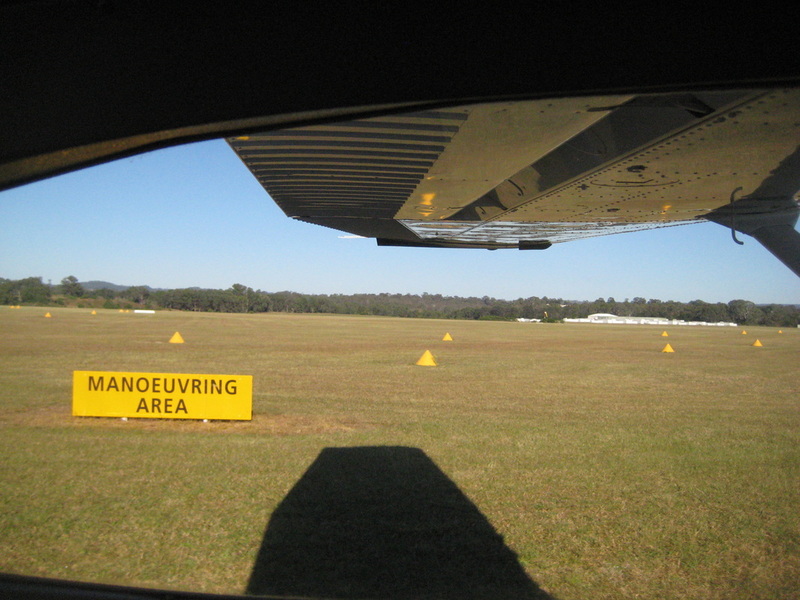 And, lastly, run-up areas are run up bays in Australia and I'm not really sure what "manoeuvring areas" on the ground are. Movement areas? And remember that their wildlife is a bit more capable of jumping on your aircraft while taking off than ours! 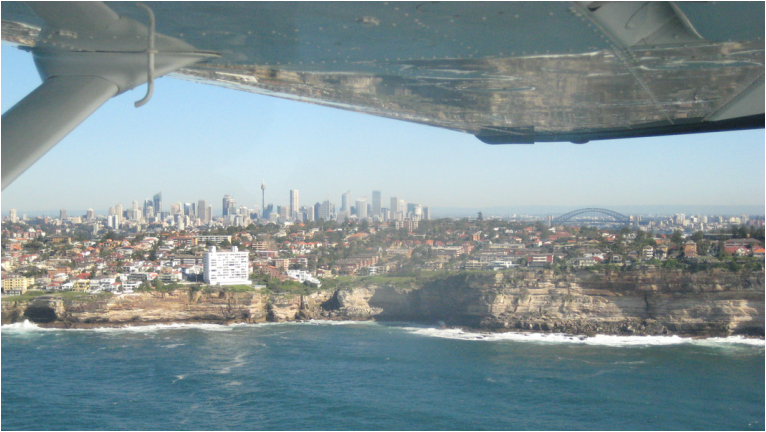 As I'm sure you saw by the pictures... Sydney is a beautiful place to see from the air. I would have never guessed there were cliffs on the coast and I LOVE cliffs. 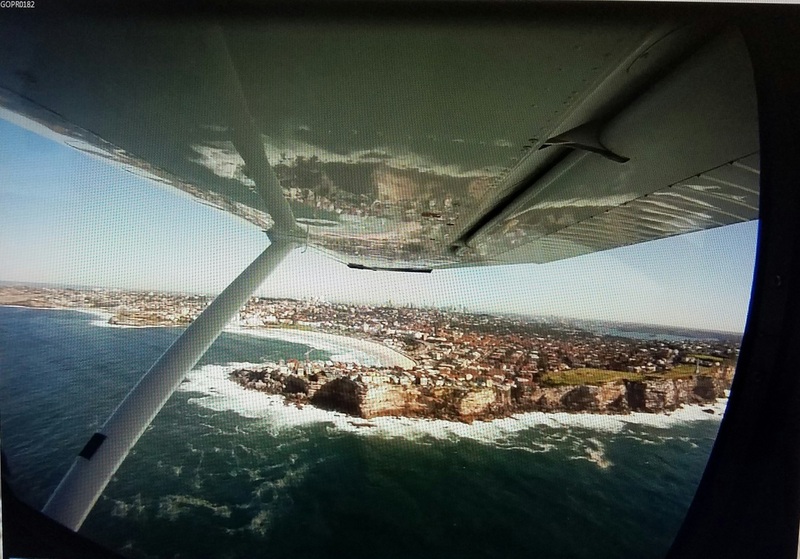 Let me hear your Australian flying adventures! Till then... fly safe and fly often!